The 2013 World Championships continued to capture the imagination of a worldwide audience on day two at the Maracanazinho on Tuesday. Two more world champions were crowned on day two as the women’s -52kg and men’s –66kg judoka took to the tatami. Rio de Janeiro, which has become the capital of the judo world this week, saw 41 women 66 men compete. Japan claimed their second gold medal of the competition as EBINUMA Masashi (JPN) produced a virtuoso display. After stepping off the medal podium EBINUMA spoke to the media in the mixed zone. Kosovo celebrated their first World Championship gold medal as world leader Majlinda KELMENDI (KOS) entered her name into the history books. Mr. Memli KRASNIQI, Minister of Culture, Youth and Sport in Kosovo, was one of the thousands of judo fans around the world engaging with the IJF on Twitter during second day. After stepping off the medal podium and hearing the Kosovo anthem, KELMENDI spoke to the media. Hosts Brazil saw Erika MIRANDA (BRA) claim -52kg silver after losing out to KELMENDI while Charles CHIBANA (BRA) had to settle for a creditable fifth-place on his World Championship debut as he showed some flashes of brilliance. After two days of competition, Japan lead the medal table with five medals ahead of Mongolia and Kosovo. Majlinda KELMENDI (KOS) showed why she is world number one as she inked her name in the sporting history of Kosovo as she became the country’s first judoka to a senior World Championship title. The meteoric rise of KELMENDI, 22, who only won the Junior World Championship in 2009, completed by a scintillating performance as she powered her way to history against Moscow Grand Slam silver medallist Erika MIRANDA (BRA). A very nervy opening saw MIRANDA receive a shido for a false attack and Kosovan KELMENDI penalised for passivity. KELMENDI stepped back from an ouchi-gari attempt by the Brazilian and threw her with an uchi-mata for a waza-ari. The win was immediately sealed as KELMENDI transitioned into osaekomi-waza and held down MIRANDA with a mune-gatame. KELMENDI booked her place in the final with a hard-fought victory over Paris Grand Slam winner HASHIMOTO Yuki (JPN) who was backed by a large contingent of Japanese supporters. Both judoka had a shido to their name with a minute left and with no scores registered a second shido for HASHIMOTO decided the contest as she was penalised for passivity. At the same stage MIRANDA bested World Judo Masters bronze medallist Andreea CHITU (ROU) with a waza-ari in a dominant performance as she kept the pressure on the Romanian for the full five minutes with a tactical koshi-jime attempt slowing down the chances of a fightback from CHITU. The first bronze medal was won by Baku Grand Slam bronze medallist Mareen KRAEH (GER) who bested world number two and CHITU. German star KRAEH, a two-time European bronze medallist, threw the Romanian with an uchi-mata for ippon to claim the first World Championship medal of the day. The second bronze medal was won by HASHIMOTO who outlasted Baku Grand Slam winner Jaana SUNDBERG (FIN). The in-form Japanese team saw HASHIMOTO receive one penalty while SUNDBERG, who still delivered career-best result, was penalised on two occasions. Olympic bronze medallist and 2011 world champion EBINUMA Masashi (JPN) put on a masterclass in Rio as he showed resolve and passion to go with his unparalleled ability on the second day. EBINUMA defeated little-known 22-year-old Azamat MUKANOV (KAZ) who was a revelation for Kazakhstan as he made a mockery of his best result before today being an Asian Championship bronze medal. EBINUMA grimaced with pain after refusing to submit to an ude-garami attempt but was defiant in his bid for a second world title. The Japanese ace stormed to victory but charging forward and throwing MUKANOV with an ouchi-gari for ippon. The newly-crowned 2013 world champion sealed a place in the final by ending the progress of Moscow Grand Slam winner Charles CHIBANA (BRA) who shone in the preliminary rounds. With 14 seconds left in the contest, EBINUMA threw for a waza-ari and held down the Brazilian with a mune-gatame for ippon as the hosts wait for a male medal continues.At the same stage MUKANOV showed star quality as he dispatched a highly-motivated Georgii ZANTARAIA (UKR). MUKANOV pressed the action with an juji-gatame but the athletic ZANTARAIA created some space and held firm until the referee brought both men back to their feet. The Ukrainian trailed on shido penalties having offended twice while MUKANOV had been penalised once and it was the latter who prevailed after scoring with a waza-ari. The first bronze medal was won by FUKUOKA Masaaki (JPN) who ensured a second successive defeat for CHIBANA. 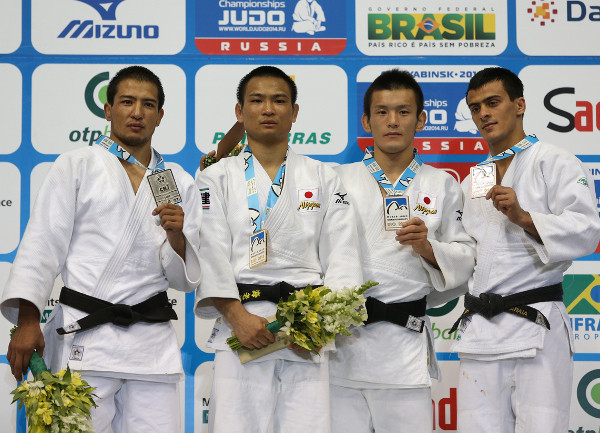 The high-flying Japanese delivered some more ippon judo as FUKUOKA joined his teammate EBIMUNA on the medal podium by registering the maximum score. The second bronze medal was won by ZANTARAIA who defeated Mikhail PULYAEV (RUS). ZANTARAIA delivered a moment of breathtaking brilliance as he fired over PULYAEV with a spectacular uchi-mata with a minute left in the contest. The 2009 world champion in the -60kg category fell to his knees with elation as he won his first major medal since moving up the -66kg category last year. The much-fancied world number one DAVAADORJ Tumurkhuleg (MGL) was left to rue what could have been after suffering an early exit with defeat to ZANTARAIA in his opening contest. World number two David LAROSE (FRA) also underperformed as he was consigned to an unexpected exit against PawelZAGRODNIK (POL) in this first contest.